How does Daddy unwind and relax on weekends? Does he go surfing or sits at home reading? Do you know what Dad loves to do when he’s not working? 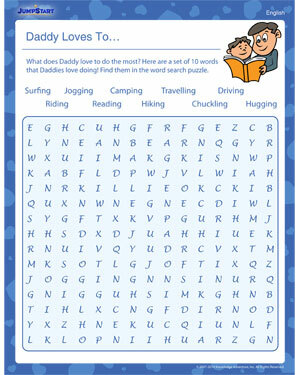 This fun word search with 10 verbs – describing what dads love to when they are not working – is a powerhouse of vocabulary for kids. Download the free vocabulary worksheet and other free worksheets for kids if you like this one!